Obituary for Shirley (Rosenberger) Johnson | Francis G. Ozog Funeral Home, Inc.
JOHNSON - Shirley (Rosenberger), 89, Johnstown, passed away November 21, 2018 at the Lutheran Home at Johnstown. Born December 15, 1928 to the late Conrad Hugo and Anna Cecelia (Axmacher) Rosenberger. Preceded in death by son, Kenneth, and siblings, Charles, Joseph, Walter, Lawrence, Gertrude, Dorothy, Rita, and Alberta. Survived by daughters, Lorraine (Dean) Emig, and Virginia (Kim) Hooper; son, Michael, and brother, John (Jack) Rosenberger; numerous nieces, nephews, and friends. 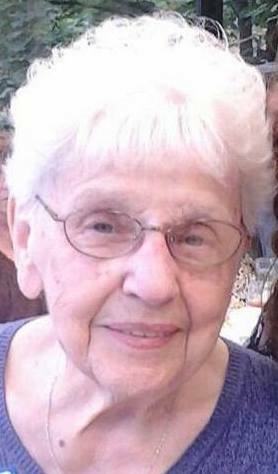 Shirley graduated from Ferndale High School in 1946, and was known to her classmates as a "Rosey," who remembered her as a "bookkeeping genius," who "livened any atmosphere." She worked at Weigle and Barber Printing Company as a bookkeeper. During her young adulthood, she was very active in her volunteer work with the Easter Seal society, where her son Kenny received years of physical therapy and related services. Throughout her life, Shirley applied her creativity to promoting church activities and fundraisers. For many years, she was an active member in the Women's Aglow Fellowship, where she assumed a position of leadership, including support in organizing the National Day of Prayer in Johnstown. She had a smile for everyone, and never failed to lend a hand to help anyone in need. Shirley loved music, and never stopped sharing this passion with others through her wide choice of songs, which expressed her great joy for life. She will be deeply missed, but remains with us in her spirit. Friends will be received from 6-8 p.m. Friday at the Francis G. Ozog Funeral Home, Inc., 710 Broad Street. Funeral service will be held 10 a.m. Saturday at the Allegheny Lutheran Home of Johnstown, 807 Goucher Street, Johnstown, PA 15905. In lieu of flowers the family suggests memorial donations be sent to either the Allegheny Lutheran Home at Johnstown or Interim Hospice 322 Warren Street, Suite 250, Johnstown, PA 15905, in memory of Shirley.